The lure of a Greek villa is undeniable - practical, welcoming, and situated spectacularly within its environment with a timeless contemporary look. Located in Igoumenitsa, a coastal city in northwestern Greece, the Private Villas Sivota are designed in this tradition, taking best advantage of views towards the Ionian Sea and a culture of indoor/outdoor living with a mix of traditional and modern building elements. Comprising​ ​four​ ​residential​ ​buildings,​ ​the​ ​villas​ ​actually​ ​sat​ ​unfinished​ ​for​ ​several​ ​years​ ​due to​ ​the​ ​country’s​ ​economic​ ​crisis.​ ​In​ ​2015,​ ​the​ ​current​ ​owner​ ​purchased​ ​the​ ​property​ ​in​ ​order to​ ​finish​ ​the​ ​project​ ​as​ ​a​ ​quiet,​ ​private​ ​residential​ ​property​ ​for​ ​the​ ​owner’s​ ​family.​ ​A​ ​place​ ​for relaxation​ ​and​ ​retreat,​ ​privacy​ ​was​ ​an​ ​essential​ ​aspect​ ​of​ ​the​ ​project,​ ​to​ ​be​ ​balanced​ ​with taking​ ​advantage​ ​of​ ​spectacular​ ​views. 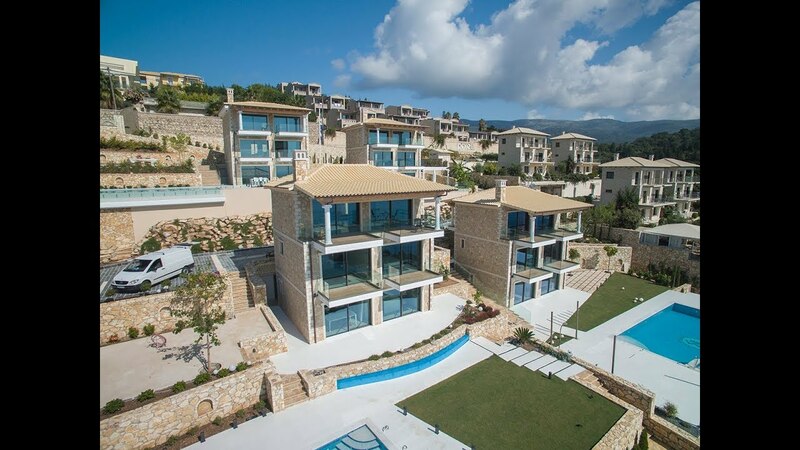 The​ ​completion​ ​of​ ​building​ ​works​ ​were​ ​undertaken​ ​by​ ​Dinis​ ​Real​ ​Estate​ ​and​ ​Development, who​ ​updated​ ​the​ ​design​ ​with​ ​local​ ​partners​ ​including​ ​Spinian​ ​de​ ​Sanchez​ ​Exterior​ ​Architect. The​ ​time​ ​frame​ ​of​ ​the​ ​project​ ​was​ ​tight,​ ​with​ ​redesign​ ​and​ ​then​ ​construction​ ​works​ ​to​ ​be finished​ ​within​ ​a​ ​year​ ​and​ ​a​ ​half. With solid brick and stone work enclosing the villa to provide privacy, the key architectural feature became the creation of an interior/exterior connection oriented toward prime views with a sliding system. For a modern application such as this, aluminium was the client’s first choice of framing as the smooth and square finishes that can be achieved from aluminium window framing suit the more minimal detail oriented design that is prevalent​ ​throughout​ ​contemporary​ ​Greek​ ​villa​ ​architecture. The​ ​selection​ ​of​ ​the​ ​sliding​ ​ ​system​ ​was​ ​​ ​paramount​ ​to​ ​the​ ​overall​ ​design. Donatos​ ​Dinis ​ ​of​ ​the​ ​Dinis​ ​Real​ ​Estate​ ​and​ ​Development​ ​Group​ ​explains​ ​they​ ​looked​ ​at​ ​a number​ ​of​ ​systems​ and ultimately ​ ​selected​ ​the​ ​Reynaers​ ​system​ ​as​ ​it​ ​was​ ​the only​ ​tested and complete​ ​system​ ​on​ ​the​ ​market​ ​while being​ ​affordable​.​ ​‘​Our​ ​client​ ​loves​ ​this​ ​system because​ ​it​ ​results​ ​in​ ​unobstructed​ ​views.​ ​ ​With​ ​its​ ​hidden​ ​profiles,​ ​this​ ​was​ ​the​ ​only​ ​system​ ​we​ ​felt​ ​that could​ ​do​ ​this​,’​ ​says​ ​Dinis. Produced​ ​in​ ​collaboration​ ​with​ ​local​ ​fabricator​ ​Simpas,​ ​the​ ​Reynaers​ ​systems​ ​ultimately specified​ ​are​ ​the​ motorised Hi-Finity​ ​with​ ​double​ ​glazing​ ​for​ ​the​ ​large​ ​sliding​ ​patio​ ​doors and​ ​CS​ ​77-HV​ ​for​ ​the​ ​opening​ ​windows.​ ​The​ Hi-Finity​ ​sliding​ ​door​ ​is​ ​a​ ​state​ -of​ -the​-​art structurally​ ​glazed​ ​door​ ​offering​ ​the​ ​possibility​ ​of​ ​floor-to-ceiling​ ​and​ ​wall-to-wall​ ​glass,​ ​along with​ ​an​ ​ergonomically​ ​designed​ ​handle​ ​and​ ​concealed​ ​locking​ ​system.​ ​The​ ​CS​ ​77-HV​ ​is​ ​the hidden​ ​vent​ ​variant​ ​of​ ​the​ ​CS 77.​ ​Here,​ ​the​ ​hidden​ ​vent​ ​ties​ ​in​ ​well​ ​with​ ​the​ ​minimalist architectural​ ​style.​ ​The​ ​vent​ ​profile​ ​is​ ​invisible​ ​from​ ​the​ ​outside,​ ​concealed​ ​behind​ ​the​ ​outer frame,​ ​which​ ​keeps​ ​the​ ​lining​ ​to​ ​a​ ​minimum.​ ​Profiles​ ​from​ ​the​ ​functional​ ​range​ ​can​ ​further​ ​be easily​ ​combined​ ​with​ ​this​ ​design. There​ ​were​ ​a​ ​number​ ​of​ ​practical​ ​issues​ ​with​ ​respect​ ​to​ ​the​ ​​ ​installation​ ​of​ ​a​ ​modern​ ​system into​ ​the​ ​existing​ ​building​ ​frame.​ ​In​ ​order​ ​to​ ​keep​ ​the​ ​view​ ​open,​ ​a​ ​wide​ ​opening​ ​was required.​ ​This​ ​necessitated​ ​a​ ​wide​ ​beam​ ​without​ ​a​ ​column​ ​or​ ​any​ ​excessive​ ​depth obstructing​ ​the​ ​view.​ ​The​ ​beam​ ​specified​ ​for​ ​the​ ​wide​ ​span​ ​opening​ ​has​ ​added​ ​carbon​ ​fibres in​ ​order​ ​to​ ​reduce​ ​the​ ​beam​ ​depth​ ​and​ ​allow​ ​for​ ​full​ ​views​ ​outward.​ ​Further,​ ​rain​ ​gutters​ ​were routed​ ​through​ ​the​ ​columns​ ​and​ ​into​ ​the​ ​flooring. The​ ​result​ ​is​ ​impressive.​ ​Traditional​ ​in​ ​form​ ​and​ ​scale,​ ​the​ ​introduction​ ​of​ ​a​ ​modern aluminium​ ​sliding​ ​system​​ ​is​ a powerful​ ​element​ ​in line with ​the​ ​local​ ​architectural vernacular.